Busted Stuff (2002), Live At Folsom Field, Boulder, Colorado (2002), Weekend On The Rocks (2005), Live Trax Vol. 3: Hartford, CT August 27, 2000 (this album) (2005), Live Trax Vol. 6: Boston, MA July 7-8, 2006 (2006), Live Trax Vol. 8: East Troy, WI August 7, 2004 (2007), Live Trax Vol. 11: Saratoga Springs, NY August 29, 2000 (2008), Live Trax Vol. 15: East Troy, WI August 9, 2008 (2009), Live Trax Vol. 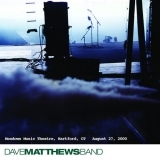 16: Cincinnati, OH June 26, 2000 (2009), Live Trax Vol. 19: Rio De Janeiro, Brazil September 30, 2008 (2010).